This forensic investigation was requested by a real estate property manager to determine if a single family residence had been used as a clandestine methamphetamine (meth) laboratory or distribution center due to rumors that it had been, suspicious activity, and reported arrests. The property manager wanted to test and make sure no contamination was present before being placed on the real estate market for sale. The sample location in the photo was 1 of 2 that were positive for meth residue out of 8 locations throughout the residence, and both exceeded criteria limits. 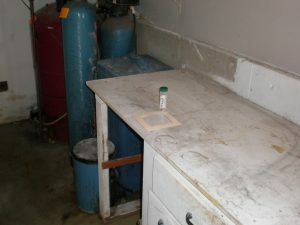 The second positive sample for meth residue in the recreation room of the basement on a wall shelf was actually higher than this pictured location which was anticipated to be the more likely contaminated area. Since the contamination is not visible adequate representative sampling is employed for these types of investigations. Based upon the sample results exceeding criteria levels Clean Air Sciences, Inc.made recommendations for initiating removal of impacted materials and decontamination of living spaces. Feb. 2018 project.